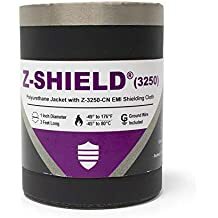 Zip Shield 7200 - Emi Jackets And Expandable Sleeves - Emi Shielding - Products - ZT | Zippertubing Co. The pressure closure track consists of Zippertubing’s proven arrowhead-and-channel interlock system that uses MIL-SPEC materials. Other track options also available. Zip-Shield® (7200) combines cable bundling with EMI/RFI shielding protection and provides a non-magnetic solution that is a perfect fit specific to your application requirements. This product includes a re-enterable closure track, durable jacketing, ground wire, and a complete 360° EMI-shielded, non-magnetic fabric. Zip-Shield® was developed as an extremely effective EMI shielding solution for hardening cable and wire bundles. The versatility of Zip-Shield® provides you and your application with many different exterior materials, colors, thicknesses, and track closure options. Track Closures: We offer many different types of track closures depending on your need. The most popular track closure styles for this product are Zippertubing&apos;s Z-Track, R-Track and EZ-Track®. Each of these tracks have their own special characteristics that make them unique; however, depending on your application requirements, characteristics such as closure strength and track height may be a deciding factor for you and your application. 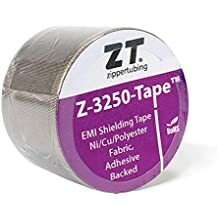 EMI Shielding: Zippertubing&apos;s Z-7200 EMI-shielding fabric has a thickness of .005”, and is comprised of copper-plated nylon that is woven in a rip-stop method with a proprietary silver-coated, non-magnetic, halogen-free, hypoallergenic fabric. Z-7200 also includes a corrosion-resistant coating on the top. This material is very useful in EMI hardening components of your sensitive equipment that may be easily affected by nearby magnetic fields. Shielding attenuation levels average 60 dB from 10MHz to 18GHz. Ground Wire: Sewn into each of the Zip-Shield™ products is a flattened, tin-platted copper, 15 AWG braided drain wire that serves both as an electrical ground and a means of termination.